I don’t remember the last time I received birthday gifts from more than 3 people in the last seven years. Maybe it’s because of Facebook? 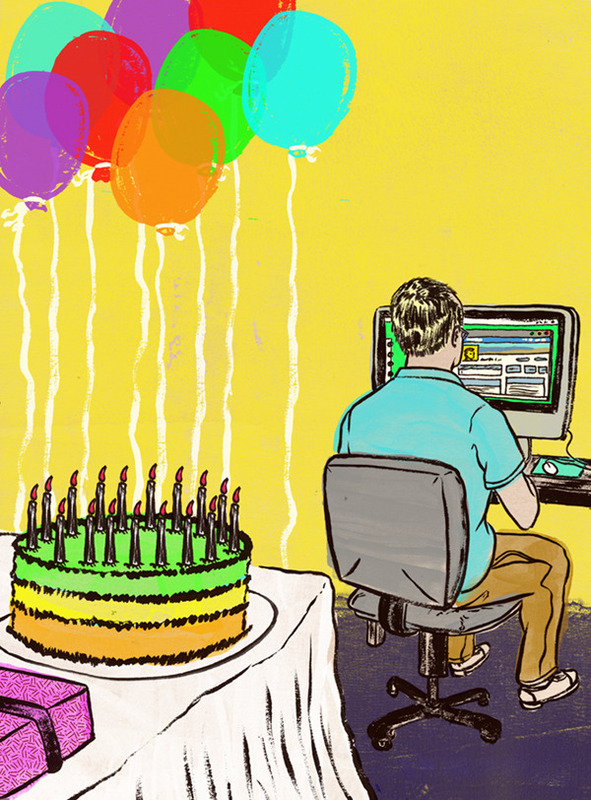 Maybe it’s because as we get older we no longer appreciate our birthdays. This is for Honolulu Magazines April issue, and my last published piece for their afterthoughts section. You can view all of my favorite pieces I’ve done for them over the last year and a half…here. Here is my latest illustration for Honolulu Magazines, Afterthoughts section for the month of March. 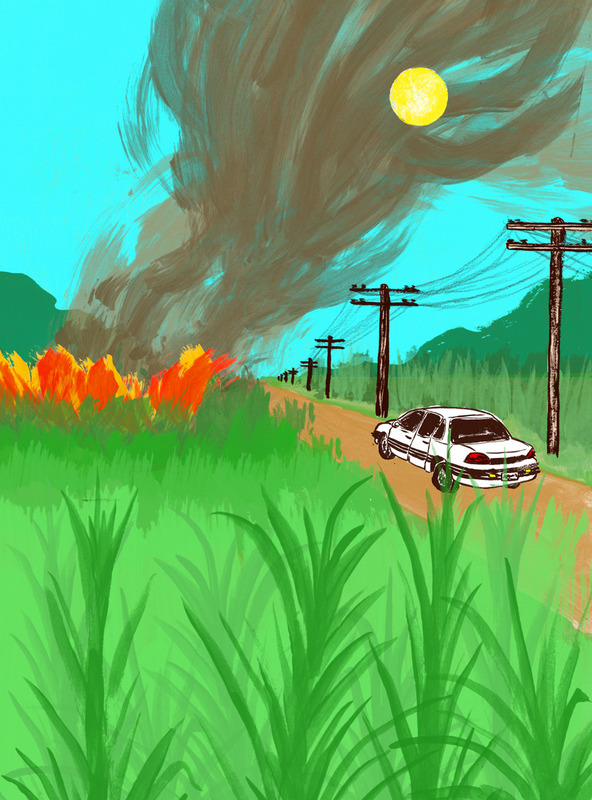 The illustration is about how normal and nostalgic sugar cane fires are in certain parts of Hawaii. People often move to these parts of Hawaii because of how lush the cane fields are but are at first turned off by the fires which are done to help the following harvest. Art Direction by Erik Ries. Sometimes it seems like one piece leads to another piece and you forget to post anything onto the internet. Here are a few published pieces that I like a lot. The Globe & Mail: The piece above is for a story about a 25 year old who goes through a quarter life crisis. In the essay, he alludes to taking on YOLO seriously by trying a bunch of new experiences. Click here to read about it. Honolulu Magazine: For the January issue, I illustrated a story about how we live next door to our neighbors and get to know them by not really getting to know them. We piece together little things like hearing conversations through the wall, getting their mail by accident, seeing moving boxes on the stairs, police tape on their door and even the awkward small talk in the hall way. Baltimore City Paper: I illustrated one of the fiction contest winners for the City paper. The fictional story I illustrated is about a wealthy magazine editor who takes his own life on Harvard’s campus after he is caught plagiarizing his interns book idea. The story is more gritty than I described here, which is why I love working for Alt Weeklys. Click here to read about it. LA Times: This is for a story about a man who gives the most unromantic marriage proposal after he wrecks his girlfriends car. This then turns into a really bad wedding and awkward honey moon. Click here to read about it. Here’s a quick piece I did for the November issue of Honolulu Magazine’s, ‘Afterthoughts’ section. This month’s illustration runs with a story about how nostalgia can hold you back from advancing in life. This solution came really easily for me in the sketching process. Here’s a new piece for my monthly column in Honolulu Magazine. The essay is about the editors uneasiness of going to Halloween parties. He believes that dressing up and pretending to be someone else is made for kids and acts as an escapism for adults who still want to be children. So whenever he’s asked to go to a Halloween party, he respectfully declines. As much as I wanted to be an “adult” growing up, I have to say, it never get’s old dressing up for Halloween now as a 20 something year old. It’s one of the best times of the year, even though I can’t eat as much candy as I used to. The solution for this essay came really easy and was a lot of fun to draw. Thanks Cody! For the past year, I’ve been working on a monthly magazine section called “Afterthoughts” with Cody (art director) and Mike (editor) at Honolulu Magazine. This section of the magazine is dedicated to life in Hawaii. Working with the guys at Honolulu magazine has been flattering and I hope to continue with them for another year. This month’s illustration deals with a slew of arcades that pose as gambling casinos throughout Hawaii. These establishments are illegal in Hawaii and there has been a recent crack down on the arcades. They claim to be entertainment but are truly venues for gambling. For the illustration, Cody and I decided to make an arcade stick out like a sore thumb in an average neighborhood. Here’s my latest piece for Honolulu Magazine’s “Afterthoughts section”. This month I illustrated an article about Mike’s personal dilemma. On one hand he is a huge supporter of riding his bike everywhere in the city, but as he get’s older he starts to see the benefits of owning a car. He can drive his friends everywhere, it makes grocery shopping much easier (he can carry more than one bag of groceries back to his place). It was super fun to work on. Side note: I am pretty sure this is my ninth or tenth illustration of a bike(s) that I have done in the past year. However, none of these were done for a bicycle magazine. Hit me up guys!